How does ABA activate a calcium/calmodulin-dependent kinase in rice? Background: Abscisic acid (ABA) is a phytohormone that plays important roles both in plant growth and development and in plant responses to environmental stresses. Cytosolic Ca2+, a second messenger involved in ABA signaling, is detected, decoded and transmitted by Ca2+ sensors to produce downstream responses. Previous studies have shown that Ca2+/calmodulin (CaM)-dependent protein kinase (CCaMK), one of the Ca2+ sensors, is not only a key regulator of plant-microbe symbiosis but also an important regulator of ABA responses. 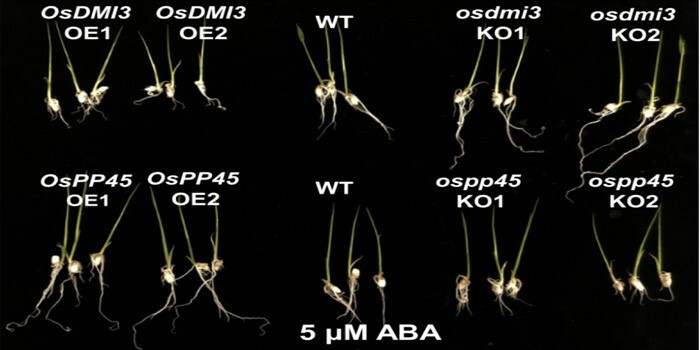 In rice, ABA induces the activation of OsDMI3, a CCaMK. OsDMI3 is required for several ABA responses, including root growth, antioxidant defense and tolerance to water stress and oxidative stress. However, the underlying molecular mechanisms are poorly understood. Questions: How does ABA induce the activation of OsDMI3? How does the activated OsDMI3 regulate ABA responses? Findings: We identified the phosphatase OsPP45 as a protein that interacts with OsDMI3. OsPP45 is a member of group K in the type 2C family of protein phosphatases. We found that, in the basal state, the PP2C domain of OsPP45 interacts with the calmodulin-binding domain of OsDMI3 to dephosphorylate Thr-263 in OsDMI3. This results in the inactivation of OsDMI3. In the presence of ABA, ABA-induced H2O2 production inhibits the activity of OsPP45 both by inhibiting the expression of OsPP45 and by oxidizing the Cys-350 and Cys-428 residues of OsPP45, forming intermolecular dimers of OsPP45. Of the two pathways, the latter is crucial both for the inhibition of OsPP45 activity and for the disruption of the OsPP45-OsDMI3 interaction. Following the disruption of this interaction, OsDMI3 is released from negative regulation and is converted to an active form, which is further activated by H2O2-induced Ca2+/CaM, resulting in a variety of ABA responses. Next steps: We want to integrate this pathway into the core pathway of ABA signaling to determine whether this pathway acts downstream of the sucrose nonfermenting1-related protein kinase 2s (SnRK2s) in ABA signaling. Lan Ni, Xiaopu Fu, Huan Zhang, Xi Li, Xiang Cai, Panpan Zhang, Lei Liu, Qingwen Wang, Manman Sun, Qianwen Wang, Aying Zhang, Zhengguang Zhang, Mingyi Jiang. (2019). Abscisic Acid Inhibits Rice Protein Phosphatase PP45 via H2O2 and Relieves Repression of the Ca2+/CaM-Dependent Protein Kinase DMI3. Plant Cell DOI: https://doi.org/10.1105/tpc.18.00506. Tags: Abscisic Acid, Calcium/Calmodulin, Type 2C Protein Phosphatase, Signals and Responses.